Looters were seen stealing from a badly damaged mall in Palu, despite ongoing aftershocks. PALU, Indonesia — The death toll in Indonesia's earthquake and tsunami has climbed to 832, the country's disaster agency said early Sunday. 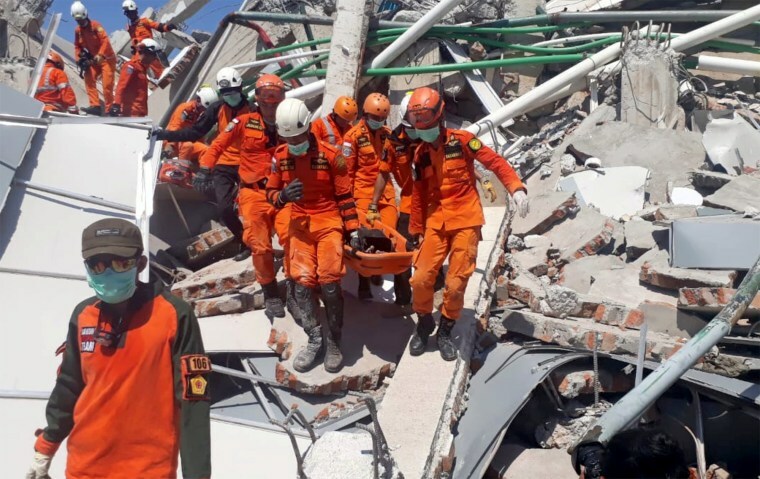 Many people were reported trapped in rubble of buildings brought down in Friday's 7.5 magnitude earthquake that triggered waves as high as 20 feet, agency spokesman Sutopo Purwo Nugroho told a news conference. Rescuers were scrambling to reach trapped victims screaming for help, while looters risked entering an unstable shopping mall to grab whatever they could find. "The death [toll] is believed to be still increasing since many bodies were still under the wreckage, while many have not been reached," Nugroho said. Damaged roads and disrupted communications meant information from certain areas was limited. Aid and supplies were being sent by military and commercial aircraft. Aerial video showed the battered coastline around the hard-hit city of Palu, population 380,000, on the island of Sulawesi. In Donggala, a city near the epicenter, footage from MetroTV showed destroyed houses and huge areas inundated by water. Looters were seen Sunday stealing from a badly damaged mall in Palu, unconcerned about their safety despite ongoing aftershocks. Some residents returned to their destroyed homes, trying to salvage anything from their waterlogged belongings. Nugroho, at the disaster agency, said "tens to hundreds" of people were taking part in a beach festival in Palu when the tsunami struck. The city is built around a narrow bay that apparently magnified the force of the tsunami waters as they raced into the tight inlet. Indonesian TV showed dramatic smartphone video of the moment the wave hit, with people screaming and running in fear. A heavily damaged mosque was half submerged and a shopping mall was reduced to a crumpled hulk. A large bridge with yellow arches had collapsed. Bodies lay partially covered by tarpaulins and a man carried a dead child through the wreckage. With damaged hospitals overwhelmed, some of the injured rested outside Palu's Army Hospital, where patients were being treated outdoors due to continuing strong aftershocks. Among them was Dwi Haris, who suffered a broken back and shoulder. Tears filled his eyes as he recounted the violent earthquake shaking the fifth-floor hotel room he shared with his wife and daughter. "There was no time to save ourselves. I was squeezed into the ruins of the wall, I think," said Haris, whose family was in town for a wedding. "I heard my wife cry for help, but then silence. I don't know what happened to her and my child. I hope they are safe." Nina, 23, who goes by one name, was working at a laundry not far from the beach. Indonesia is frequently struck by earthquakes, volcanic eruptions and tsunamis because of its location on the "Ring of Fire," an arc of volcanoes and fault lines in the Pacific Basin. AirNav said one of its air traffic controllers, aged 21, died in the quake after staying in the tower to ensure a flight he'd just cleared for departure got airborne safely. More than half of the 560 inmates in a Palu prison fled after its walls collapsed during the quake, said its warden, Adhi Yan Ricoh. He said there was no immediate plan to search for the inmates because the prison staff and police were consumed with the search and rescue effort.